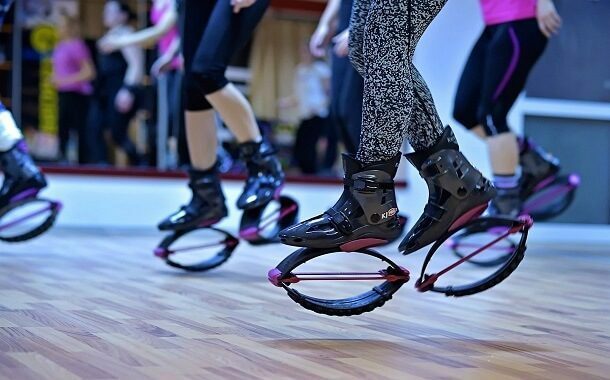 How Much do Kangoo Jumps Classes Cost? As you’d probably guess, Kangoo Jumps refers to an aerobic/fitness technique that is done with a special pair of sports shoes equipped with elastic springs. These moves that can be executed with the special pair of shoes, resemble very much with the specific aerobics moves, but the major difference is that all moves are accompanied by jumps that amplify their effects. So, Kangoo Jumps cannot be considered a form of freestanding aerobics because it transposes all the exercises, specific to classic aerobics, on some boots with elastic springs, increasing the fun and efficiency dose and eliminating the eventual boredom resulted from the countless hours spent in aerobics room over the years. The impressive number of calories you can burn through all the exercises performed on Kangoo Jumps boots are another powerful argument. Experts say you can burn around 150 calories in about 10-15 minutes, so imagine how many calories you could burn in 1 hour. You can actually jump on one spot, like a kangaroo, practice Tae Bo or aerobics, and results will be tenfold more visible in a much shorter time. In addition, you’ll see that it is extremely fun and you won’t get bored too quickly like you usually do after tens of aerobic sessions. Depending on the area you live, the state or the type of gym you choose to go to, the price for a Kangoo Jumps class starts at about $7.20 with your own boots and $13.40 with boot rental included, and can go as high as $15 per class + $5 boot rental. 10 Kangoo Jumps classes with your own boots at $100. • For joints’ protection: Kangoo Jumps reduce the impact on the knees, wrists, hips and spine by 80 % compared to jogging or running, so they prevent injuries by neutralizing the impact with the ground. For this reason, it may be an alternative of recovery for people who suffered injuries, some surgeries or suffer from joint pain. • Kangoo Jumps fight osteoporosis, strengthen the spine, increase bone density and help you regain your posture, practically forcing you to take a stand right posture during exercise in order to maintain your balance. • Kangoo Jumps improve the functioning of your lymphatic system, by accelerating the process of losing weight, they have a great contribution to the improvement of your metabolism, helping you burn more calories and eliminate cellulite in less time. • Kangoo Jumps classes strengthen your heart, they improve cardiovascular circulation and increase lung capacity and oxygen to the body by up to 18%. Moreover, this type of exercise increases your overall strength, helping you to dedicate more time to physical effort and to get visible results faster. • Kangoo Jumps slow the aging process, and this is quite visible: the skin becomes more elastic and firmer, gaining a younger aspect; they contribute to restoring muscle and bones; they strengthen the immune system and help “clean” cells by eliminating harmful toxins; they also restore your vitality and tonus in just minutes! • This type of jumping as form of exercise improves your coordination and balance, but also your body flexibility, making you feel at the same time feathery, like floating. It seems that Kangoo Jump is also an ideal exercise to combat depression, nervousness, anxiety and body at the same time it shapes your entire body, especially thighs, abdomen, legs and buttocks. Should the average working Jane take Kangoo Jumps Classes? If you want to get in shapestay healthy and look great without boring and exhausting effort, then Kangoo Jumps classes are for you. You’ll have a lot of fun, while working out in a professional gym, making sure that you do your exersises in the right way and don’t risk any injuries. https://www.thepricer.org/wp-content/uploads/2016/02/kangoo-jumps-classes-costs.jpg 380 610 qSign http://www.thepricer.org/wp-content/uploads/2016/11/pricerlogonew.png qSign2016-02-22 07:51:012016-02-22 07:51:01How Much do Kangoo Jumps Classes Cost? How Much Does Quitbit Cost? How Much Does a Trip to St. Martin – St. Maarten Cost?